As far as dream jobs go, being an organic flower farmer ranks right up there with travel writer, cake baker, and rock star. As Lynn Byczynski thoroughly explains in The Flower Farmer, growing organic flowers for profit is a completely reasonable and realistic career choice that anyone can accomplish. Byczynski, who has been growing flowers commercially for 20 years, takes the reader step-by-step through the beginner stages of flower farming. She includes “foolproof” flowers for the novice and discusses annual beds, perennial beds, bulbs, flowers for drying, herb bouquets, foliage and grasses, and grains. 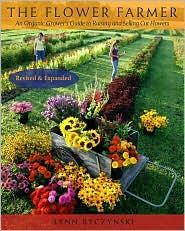 Subsequent chapters examine soil and site selection, buying plants, techniques such as transplanting and pest control, how to extend the growing season, flower arrangement, and marketing the flowers. In addition to the knowledge that Byczynski shares about flower farming, the book itself has been exquisitely designed and features numerous diagrams and several color photographs of flowers. It’s fun just to flip through the book and study the Songbird Cardinal’s layered petals or the brain-shaped Cramer’s Burgundy. The chapters are also interspersed with even more detailed information on various flowers like sunflowers, poppies and peonies, as well as profiles of flower farmers throughout the United States. The book concludes with a complete list of recommended cut flowers that each have their own description and also an extensive sources and resources guide for seeds, bulbs, marketing supplies and more. Everything you ever needed to know about becoming a farmer in the floral sense is at your fingertips in The Flower Farmer. Byczynski says that just one acre of flowers can generate an income of $25,000-$30,000 per year. Even if you can’t imagine yourself tending fields of flowers day in and day out, The Flower Farmer is still a worthy companion for anyone who wouldn’t mind a little bright foliage in a small garden or on the coffee table.